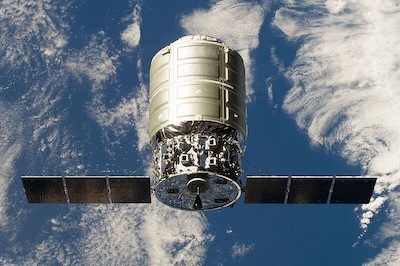 The Orbital Sciences Cygnus cargo ship completed its first visit to the International Space Station on Tuesday, departing the complex after a highly successful test flight as workers load the second Cygnus spacecraft with supplies for another mission in December. At the controls of the International Space Station's robot arm, astronauts Luca Parmitano and Karen Nyberg oversaw Tuesday's departure. 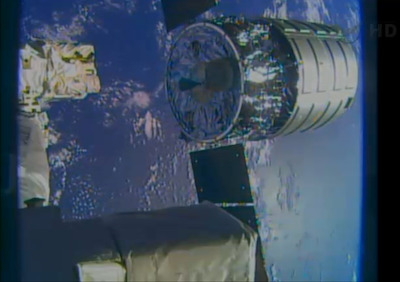 The 58-foot-long Canadian-built arm let go of the Cygnus spacecraft at 7:31 a.m. EDT (1131 GMT) as the space station soared over the South Atlantic Ocean east of Argentina. One minute later, a space station crew member issued a planned "abort" command to send Cygnus on a safe trajectory away from the complex. The automated spaceship fired pulses of its miniature rocket jets quickly move out of the space station's "approach ellipsoid," an imaginary safety zone around the complex. Built, owned and operated by Orbital Sciences Corp., the spacecraft is packed with 2,850 pounds of trash marked for disposal when it plunges back into Earth's atmosphere Wednesday over the South Pacific Ocean between New Zealand and Chile. Wednesday's re-entry, scheduled for 2:18 p.m. EDT (1818 GMT), will end a five-week shakedown mission designed to prove the commercial spacecraft can safely do its job of delivering supplies to the space station. Two braking burns Wednesday at 9:06 a.m. EDT and 1:41 p.m. EDT (1306 GMT and 1741 GMT) will guide the Cygnus to re-entry over the sparsely-populated South Pacific. The test flight wraps up a public-private partnership between Orbital Sciences and NASA, in which the federal government invested $288 million into the design, development and testing of the Cygnus spacecraft and its Antares rocket. Orbital Sciences spent even more of its own capital in the project. The Cygnus spacecraft launched Sept. 18 on an Antares rocket from Wallops Island, Va. Credit: Orbital Sciences Corp.
NASA turned to commercial providers to take crew and cargo to the space station after the retirement of the space shuttle. The initiative has yielded two cargo transportation suppliers - Orbital Sciences and SpaceX - that NASA says it can count on for operational missions. Development of a piloted spacecraft and human-rated rocket started a few years after the cargo initiative, and NASA hopes to have at least one commercial crew vehicle ready for a flight to the space station by 2017, assuming the program gets a healthy budget. Fitted with a pressurized module built by Thales Alenia Space in Italy, the Cygnus can haul up food, experiments, computer equipment, clothes and spare parts for the space station's crew and systems. The Dragon spacecraft built by SpaceX has the unique ability to return cargo intact with a splashdown in the Pacific Ocean. The Cygnus can carry up more bags of material than Dragon. 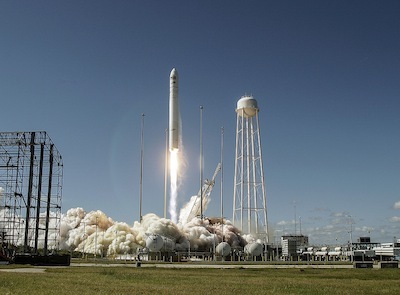 The Cygnus spacecraft launched Sept. 18 aboard an Antares rocket from Wallops Island, Va. Officials aborted the ship's first try to rendezvous with the space station due to a discrepancy in navigation data between GPS systems on the Cygnus and the space station. A software patch resolved the problem, leading to a smooth arrival Sept. 29. NASA considered the mission a demonstration and kept critical cargo off the flight, but the agency elected to pack the Cygnus with about 1,300 pounds of non-essential supplies, mostly food, student experiments and crew comfort items. The six-person crew unloaded the Cygnus cargo within a week and began rounding up trash and unnecessary equipment to put back inside the craft's pressurized module, which is about the size of a mid-sized moving truck. The astronauts put in 2,850 pounds of trash for disposal, according to NASA. Orbital named the maiden Cygnus spacecraft for G. David Low, a former astronaut and Orbital Sciences executive who died in 2008. "The near flawless in-orbit performance was a great testament to the work of the Orbital/NASA team that designed, built, tested and operated the spacecraft, and also a clear indication of how capable and versatile an in-space logistics vehicle we now have for both space station cargo delivery and other advanced space missions," said David Thompson, Orbital's chairman and CEO. The Cygnus departure Tuesday came as technicians prepare an identical spacecraft for flight at NASA's Wallops Flight Facility on Virginia's Eastern Shore. Set for liftoff in a window from Dec. 15 to Dec. 21, the next Cygnus flight will be Orbital's first operational cargo mission under a $1.9 billion contract with NASA. The contract covers eight resupply flights through 2016. Workers this week are stowing about 3,000 pounds of cargo inside the next Cygnus spacecraft's pressurized module. Orbital Sciences says all hardware for the December mission is at the launch site. "All of the hardware for the third Antares and the second Cygnus is now at the final assembly facilities at Wallops Island, and NASA is just this week providing about 3,000 pounds of cargo for which our first operational flight under the CRS contract," Thompson said Oct. 17. "We will aim to make a special delivery to the station before Christmas."